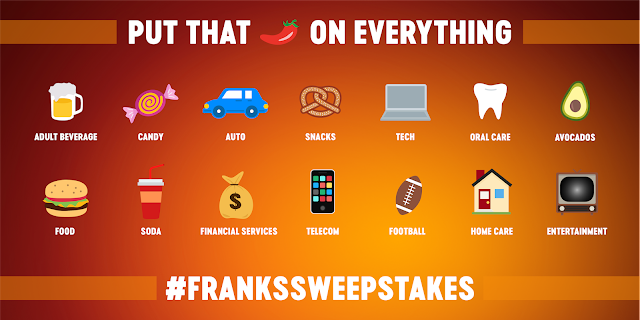 On Sunday, February 3, 2019, Frank’s® RedHot® will run #FranksSweepstakes on Twitter, asking participants to “Put That Emoji on Everything” for a chance to win products or services seen on Game Day. The sweeps works like this — during an ad for a product or service in one of the categories designated by Frank’s, just tweet the Cayenne Pepper emoji and the corresponding emoji representing that category (beer, car, avocado, etc.) plus #FranksSweepstakes, and you’ll be entered for a chance to win the related prize like a trip, gift cards and even a car. Sweepstakes participants can pregame with Frank’s too thanks to a partnership with chef, filmmaker and author Andrew Rea of Binging with Babish. Look for his spin on party food using Frank’s original cayenne pepper sauce on FranksRedHot.com/recipes. The “Put That Emoji on Everything” Sweepstakes will begin at 3:30pm ET on Sunday, February 3, and run through 11:59pm ET. For complete official rules and eligibility, visit FranksRedHot.com/sweepstake… and don’t forget to put that s#!t on everything this Game Day! This sweepstakes is part of a new Frank’s campaign including TV and online videos led by creative agency, Grey New York. “We’re taking a subversive approach to prove that Frank’s goes with everything you typically see on Game Day — even things you really, definitely, absolutely wouldn’t expect,” said Rob Lenois, Deputy Chief Creative Officer at Grey. It all started back in 1920 when the first bottle of Original Cayenne Pepper Sauce was introduced. Made with a premium blend of aged cayenne peppers, Frank’s RedHot adds the perfect blend of flavor and heat to your favorite foods. Frank’s Cayenne Pepper Sauce was used as the secret ingredient in the original Buffalo wings created in Buffalo, NY in 1964. Try our family of products including the Original sauce, Buffalo Wings sauce, Queso Dip seasoning mix, Buffalo Ranch seasoning, Frozen Buffalo Wings and more. Visit www.Franksredhot.com for more information and recipes. Frank’s is one of McCormick & Company's brands. As a global leader in flavor, McCormick has built a portfolio of leading flavor brands that enhance people’s enjoyment of food all around the world. Every day, no matter where or what you eat, you can enjoy food flavored by McCormick. McCormick Brings the Joy of Flavor to Life™.